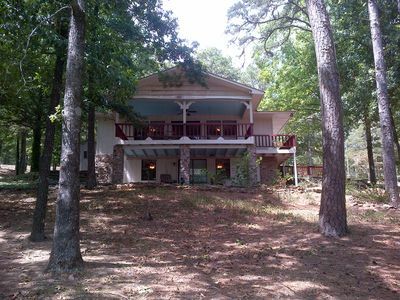 First of all, this house has a grand view of the lake! 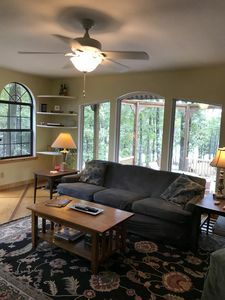 The lake view can be enjoyed from the living room, dining room, kitchen, master bedroom, upstairs loft area, and the extensive covered deck of this house. 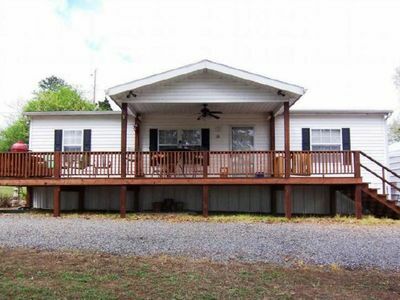 This property makes for a peaceful get-a-way without getting too far from town. 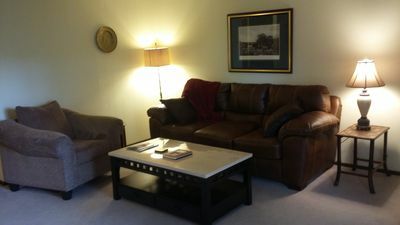 It boasts a master bedroom with king size bed with Temper-Pedic mattress and flat screen TV. Adjoining the master bedroom is a master bath that dreams are made of equipped with separate vanities, Jacuzzi tub and walk in shower big enough for the whole family. Upstairs is the second bedroom with another king bed. 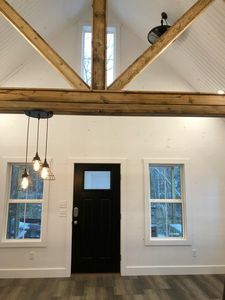 The upstairs bathroom has a stand-up shower and adjoins the upstairs bedroom and upstairs loft/3rd bedroom with 4 twin beds. 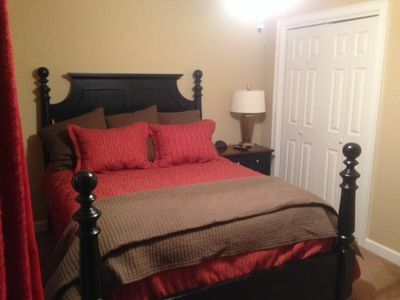 A 4th bedroom with King memory foam bed was added in the basement in January 2015. 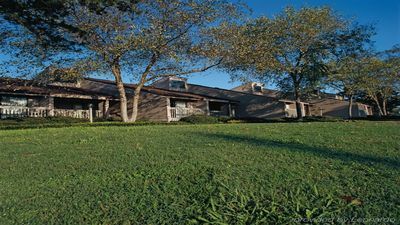 Also added is a large bath adjoining this second master with large walk in shower. 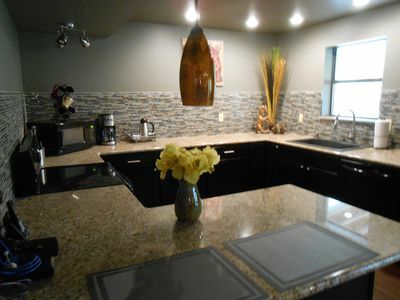 With an in-room wet bar, microwave and mini-fridge, this addition is like a bonus rental. 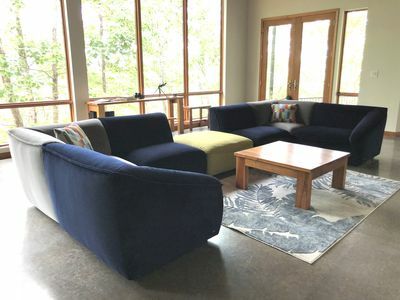 The living area is back on the main floor with plenty of room to spread out with large open living room, dining room with large table for 6 and kitchen with long counter perfect for serving meals and room for 5 more additional stools. 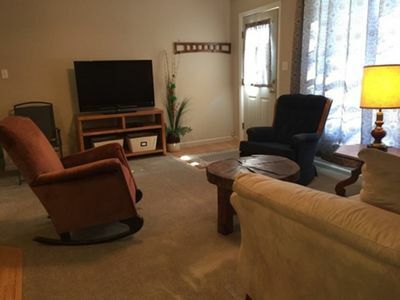 To round out the main floor you have a half bath and spacious laundry room. 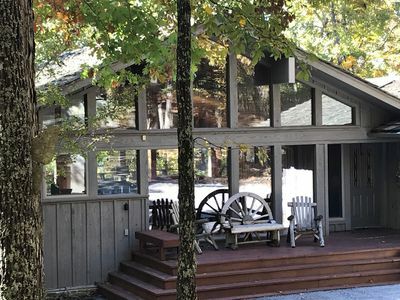 To add to the inside space is a covered porch that wraps around the majority of the house. 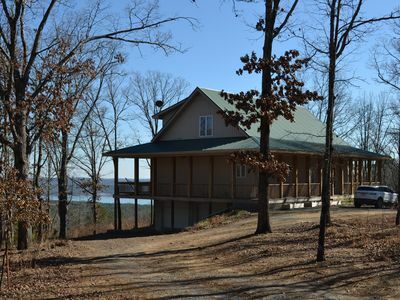 You will love sitting out on the porch feeling the breeze, taking in the lake views and viewing all the wildlife including deer, turkey and foxes. The circle drive gives you plenty of parking for all your lake toys. 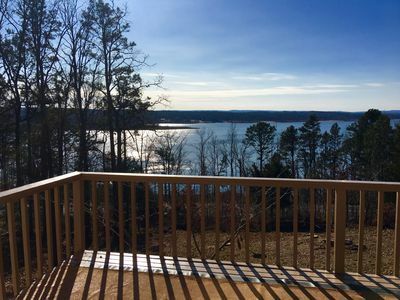 You won't have any trouble getting your boat in the water as the house is just 4 miles to a large community boat launch with plenty of parking. 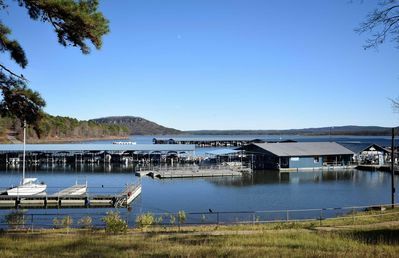 If you want to leave your boat in the water, you can rent an overnight slip at Lacey's Narrows Marina (501) 825-6214 for $20/night. 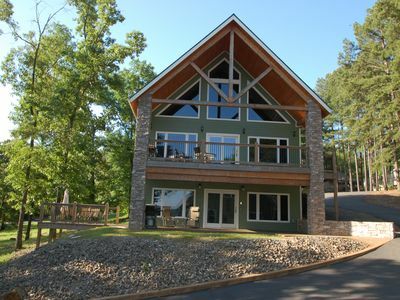 This property is truly the perfect place to enjoy a relaxing vacation with your family and friends. Also, we supply hotel type shampoo, conditioner, soap and toilet paper in the bathrooms, and we provide a roll of paper towels in the kitchen, so that is less for you to bring with you. 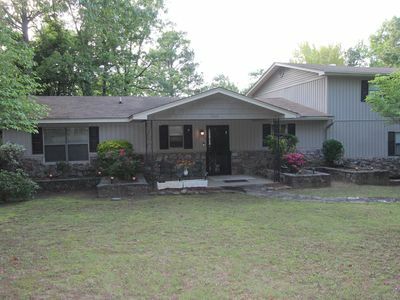 If you feel the need to leave the property, you are less than 4 miles from the towns of Greer's Ferry and Fairfield bay. Janssen’s Lakefront 2 miles Best Desserts in the world!!! Large Mouth Pizza 5 miles Try the chicken wings! FAIRFIELD BAY - Rest & Relax surrounded by beautiful breathtaking views. 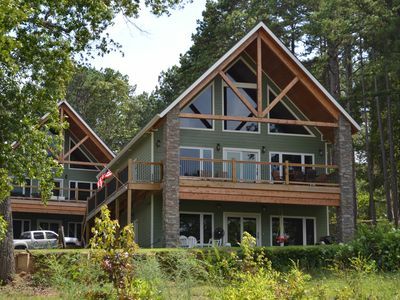 New Lakefront Cabin with Boat Slip - Magnificent, Unobstructed View! 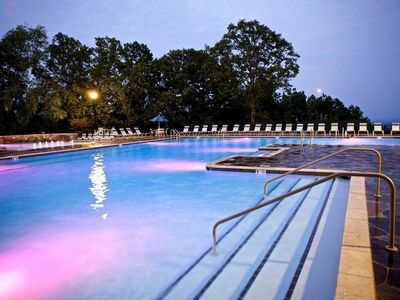 Best Resort Area in Fairfield Bay! 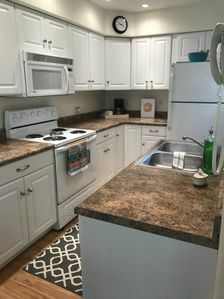 Newly Updated, Decorated and Affordable! 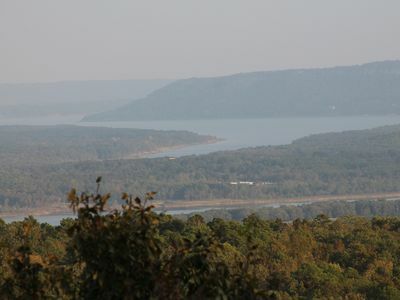 Ozark Oasis has a stunning view with lots of room to relax! 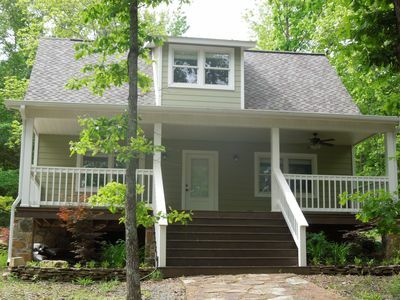 Minutes from lake!